There are two ways to build the roof frame. The manual tells you to assemble the roof frame on the ground, and then (using assistance) lift it up and place it on top of your walls. I’ve read this actually isn’t as difficult as it sounds. However, there were only two of us building this, so we decided to assemble the roof on top of the walls, piece by piece. It’s actually quite easy also. First, we attached Parts 8 and 9 on each end of the greenhouse, to form the gables. Second, we attached Parts 10 and 11 on the ground to make the Crown. Third, using two ladders, we fastened the Crown to the top. At this point it’s easy to lay the Roof Studs (part 15) on top of the roof in place. Using a tall ladder inside the greenhouse, we attached the top of each roof stud to the holes in the Crown. That leaves the ends of the roof studs resting loosely on the wall tops, so you can (oh goody!) slide more bolts in the tracks. In the photo above, the roof ends (parts 8, 9) are in place, the roof crown is up, and we’re starting to lay out the roof studs on top. Good news, the manual is correct on page 13 when it tells you how to install the bolts in the roof studs. But, those counts are only correct if you plan on installing the roof vent windows in the positions shown in the manual. We decided to put all four of our vents on one side of the greenhouse, so I had to refigure which bolts to stack in each stud. It’s really not hard. Figure out where you want your roof vents, and look at the illustration on page 13. To start with, each roof stud is attached with a short bolt at the top. 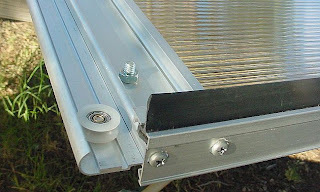 Then, if the roof stud is crossed by one Horizontal brace, you need one long bolt floating. 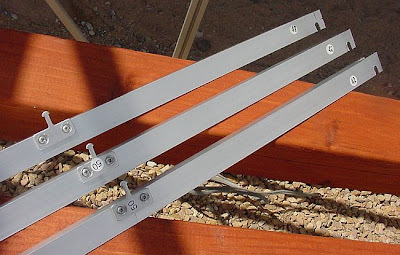 If the roof stud is crossed by two Horizontal braces, you need two long bolts floating. 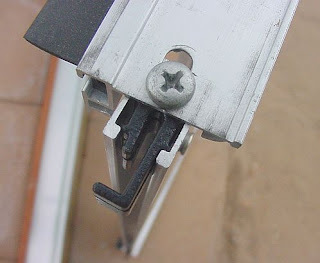 If the roof stud attaches to either side of a window vent, you need a short bolt floating, ABOVE the long bolts used to secure the braces. And finally, you’ll need a short bolt at the bottom of the stud, to attach it to the top of the wall frame. If you just study the drawing and think about what each stud needs, you can figure it out. As with the Part 30 braces for the walls, be sure you’re pointing the arrow stickers on the roof braces into the corners. The photo above shows the roof frame complete. Page 13, step 5 has you sliding the window support beam (part 42) onto the roof studs where you want to position your window. This piece will eventually snug up against the bottom of the window. I managed to put these on upside down the first time; the correct orientation is shown in the photo to the right, with the U-shaped openings for the bolts pointing down towards the ground, and the flat part (with the part 42 stickers) facing inside the greenhouse. Also, see those two tiny drilled holes in Part 42? 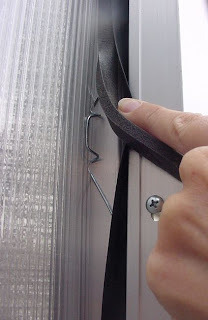 Those are to attach Part 50, which is the little tab that will catch in the holes of your window handles when you prop the vents open. For some reason, the manual doesn't have you attach Part 50 to Part 42 until after you've installed the windows. At that point, you're up on a ladder, squinting in the sun, and trying to screw very tiny screws in place, one of which will most certainly fall in the dirt. And no, they don't include extras. Tip: You might as well attach those little Part 50 tabs to Part 42 right now, while you're standing on Good Mother Earth. Then they will look like the picture above, and you can go ahead and install them in the roof frame. I'm not impressed with the quality of the handles. One handle had a rough edge that prevented it from moving easily, but the aluminum is very soft, and it just took a second to smooth it out with a small file. This problem apparently only occurs in some kits. It did occur in my kit. When I assembled the windows, I noticed the polycarbonate window panels fit tightly in the frame from side to side, but they could move up and down in the frame by nearly 1/2". We ended up taking down all four windows and caulking each poly panel in place with clear caulk, on the outside of the window. If I build another Harbor Freight greenhouse, I'll check to see if the window panels fit snugly in the window frame. If they don't, I'll caulk them in place from the start, before I ever install the windows in the roof. (Be sure your frames are nice and square before you apply any caulk.) Since I caulked the poly panels in, I've had no more problems with the panels moving in the window frames. One more note...if you ever do have to take down the windows, after your greenhouse is all assembled, as we did, please take note of the order you remove them, and put them back in the same order. We didn't do this, assuming the fit was the same for each window opening. Apparently it's not, and once the roof panels are in place, it's very hard to make any adjustments to the window openings. My windows have not fit as well since we took them down (and put them back in a different order.) Rats! Amazingly, I found the directions for installing the windows confusing! To install the windows, take them one a time to the peak of the roof, at the end where the track starts, and slide the top of the window into the track on the side of the roof where you want your windows. (You can put your windows on both sides of the roof, or all on one side.) Holding the bottom of the window, you can now slide it to wherever you want it in the roof. Then lay it down in position, and it will hang in place. When the windows are where you want them, you snug part 42 up to the bottom of your window. If you’re ganging windows together, as I did, the Parts 42 just overlap each other, and share the same bolt in the track, as you can see in the far right of this photo. I ganged all four windows together on one side, and I had to do a bit of adjusting and wiggling to get all the windows to open smoothly. All four windows are now installed. Tip: In this photo, see how all four of the window vent handles are just hanging straight down? Don't do that. Here's why. Instead of locking the handles into the (part 50) peg on the window frame, I left those handles hanging down while we were installing panels. Suddenly (did I mention it's windy here?) an odd wind came up under one vent window, popped it wide open, and then bent it backwards until it popped out of the track and flew about 8 feet. Landed on the roof of our house. Very exciting. Nothing was broken, and we just slid it back into the track. This would not have happened if I had fastened the window handles onto the peg on the frame, into any one of the holes. In the right wind, the vents can still open up a bit, even in the tightest (lock down) position on the handle. But, it sure won't flip over backwards and land on your roof. Keep 'em secured! The door has also been redesigned along the way. The newer version (mine) has tracks to hold the poly panels in place, and the old version had small pegs to hold the panels in place. Frankly, I could not make heads or tails out of the drawings or instructions on page 15 for assembling the doors. I think it may be the worst page in the manual, and I wonder if the instructions have gotten a bit muddled during the design change. The two lower illustrations are important, but for the general fitting-together-of-pieces I found photos online to be much more helpful, so I've included a lot of pics here. A picnic table is a good work height for assembling the doors. Here’s a completed door, front side up. The top and bottom of the door has wheels that slide on the tracks in the door frame. The black rubber gasket will face the greenhouse. If your rubber gaskets are sticking out beyond the frame end, just wiggle them in the track until they’re flush. Note: Each poly panel in the door slides into a fairly tight groove in the cross braces. If you’re sealing the edges of your panels with aluminum tape (see the section on Adding the Panels) you should just skip taping these panels; the edges won’t be open to the elements anyway, and it can make it really hard to get the panels in (especially if the poly panel has any kind of a burr on the cut edge.) I taped all eight door poly panels before I understood how the door was assembled, and it caused me grief! If you find that some of your door poly panels will not slide into the grooves in the door parts, they may have a cutting burr on the edge of the poly panel, making the edge just a bit too fat to slip into the groove. I found I could take a pair of wide-jaw pliers, and working along the panel edge, just squeeze the edge gently to compress it a bit. Not much...a snug fit is better to decrease air leaks, but you can do this if the poly panels seem too fat to go into the grooves. All of the horizontal parts are attached by putting screws through the slotted holes in the side pieces (part 33). Be sure the arrow stickers on the central braces (part 36) point up as you install them. I attached all the horizontal pieces (top, bottom, central braces) to one side piece (part 33) first, fitting the polycarbonate panels (part 64) in place as I worked down the door. Then I attached the other side piece (part 33.) Generally the whole process takes a bit of fiddling and sliding parts around to hold all four of the poly panels tight. I believe you could assemble the parts with the rubber gasket up (viewing the back of the door) or with the rubber gasket down (viewing the front)...whatever works for you. There are two small black plastic pieces (part 51) that get inserted in each end of the bottom rail (part 37) before you attach it. Because the holes for the screws are slotted, you can adjust this part to either be high or low. When we installed the doors, we found the small black pieces (part 51) had to be adjusted as low as possible so they would fit over the floor plate. Tip: After we installed the doors, I also found that some fiddling/adjusting of this part controlled how easily the door would slide over the bottom rail. You might need to play with it. Here’s a front top door corner. 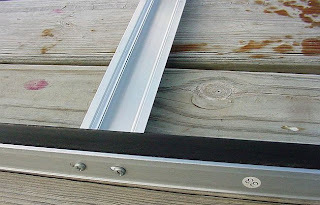 You bolt the top door frame (part 35) to the Door Slider (part 34, which has the wheels that slide on the track.) This is how it looks from the front. Here's how a top corner looks from the back. This is one of the wheels that slides on the track at the top of the door, and the black rubber gasket will be touching the front of the greenhouse. One of us slid the top wheel on the track at the top, and the other guided the bottom onto the bottom track. This is fiddly because of the small black plastic clip that has to be threaded onto the bottom track, and I pretty much had my ear in the dirt to see that it was lined up correctly. VERY Important Tip: There's a very important small illustration at the bottom of page 15, labelled Side View. It's shown to the right. This shows you that the small black plastic clip Part 51 has to be guided onto the bottom door track so the small vertical part of the aluminum track is actually threaded up into the vertical gap in the center of black plastic part 51. 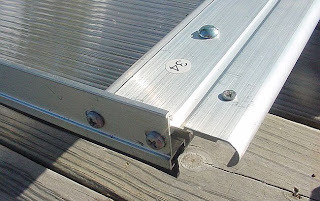 If you do it right, the bottom leg of the black plastic "L shape" goes down the front and under the L-shaped aluminum door track, as the illustration shows. Note: It's actually possible to install the doors incorrectly at the bottom, so that the black plastic part 51 is just sitting on top of the door track, sliding along in the small valley there. This is not right. Although your doors can function (sort of) this way, they can also fall off, since they're not truly captured at the bottom in the manner the kit intends. This also means your doors could more easily blow out in a big wind, so be sure you've installed that bottom part correctly. 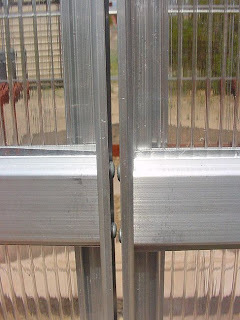 When they're installed right, the doors are firmly captured at the top and the bottom. There’s one joint in the floor plate that was difficult to get the left door over. Once you get it over the joint, you’re home free, but it was hard. We had to adjust that black plastic part 51 down as far down as we could, using the screw closest to it, and even then it took a lot of gentle tugging and bad words. You'll want to come back and deal with this part much later, when the rest of your greenhouse is completed, but I'll include it here since we're talking about doors in this section. When I was done with the doors, and had adjusted every screw I could find of to get them sliding freely, I was very happy with how easily they moved. But I still had a gap between the two doors; a good quarter inch at the bottom, and slightly less at the top. Some people have reported that their doors have a uniform gap between them; others (like me) have a gap slightly larger at the bottom. Either way, it's annoying, and no good for holding in the heat during the winter. See photo to right. I first tried to fix this gap by buying some high quality 1/4" rubber door gasket, and attaching it with screws to both doors. This didn't work; the doors slide so freely that they just moved the same distance apart, and so I had the same gap, but nicely lined with $7 worth of pretty white door gasket. Crud. 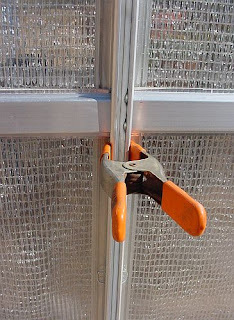 Even worse, if you use more weather stripping than you need to close the space between the two doors, you also create NEW gaps at the far edges of the doors, because you're now moving the black rubber door gasket further away from the metal greenhouse frame than the kit intended. To see what I mean, just open up your doors so there's a very small gap between them, and then feel the outer edge of the door, where the black gasket is. You'll feel the gap where warm air could escape. So, first lesson is, I found that plain foam weather stripping (the closed cell type, so it won't soak up rain water) worked better on my door gap than rigid rubber door gasket. I needed something that would close down the gap, but would compress easily under pressure. You may need to experiment to determine what works best for your own door gap situation. After I'd changed out the weatherstripping in the gap between the doors, I found I still needed to apply a strip of foam weatherstripping to the outer edges of the doors, under the black rubber door gasket, to really close down any potential air leaks around the doors. This photo shows how I just held the black rubber door gasket out of the way, so I could affix the self-adhesive foam weatherstripping to the frame right under the gasket. This allows the rubber gasket to hit against the foam stripping, and to make good contact the whole length of the door. Now I have a good tight seal around the outer edges of my doors when they are closed, and a good seal in the center between the two doors. Now, on to the question of keeping the doors closed. Since my doors slide so easily, they can actually be opened by a strong wind blowing directly on them. Someday we may figure out a way to build a special latch, but in the meanwhile I'm happy with my unlovely but functional clamp. The clamp has a lot of strength (takes both hands for me to open it) so I don't worry about it popping off, and it thoroughly compresses my weather stripping between the two doors. Recently we had about nine hours of winds in the 30-40mph range, blowing directly on my greenhouse doors. Since they were actually predicting gusts over 60mph, I added an additional two clamps (top and bottom.) Normally, I just use one. If the GH doors are closed, the clamp is on. I know Martha Stewart would have a prettier solution, but she's not here. A side note about doors in cold climates (added 12-16-08.) Although not a problem for me, some Harbor Freight owners have posted that the sliding doors have a nasty habit of freezing closed in cold wet weather. Some say this is made worse by the addition of a rubber gasket (as I applied on mine, above.) Others say the ice accumulates in the lower track. 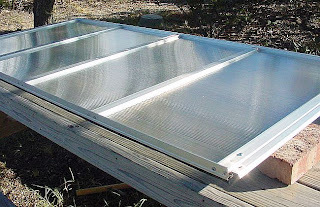 If you live in a cold climate, it's not a bad idea to think which side panel you might remove for emergency access to the greenhouse interior, if the doors freeze shut in a bad storm. Okay, enough door fiddling. 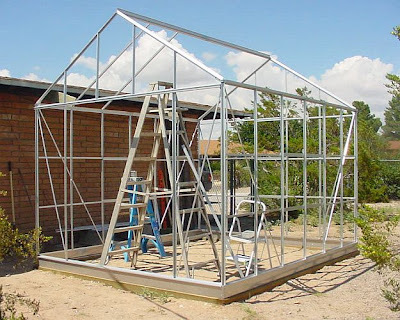 Now you can click here to go to the really important section, Part Five, Modifying the Greenhouse Frame for Strength! As you mentioned, parts are often missing. We are on page 12 and the peak caps (part 54) are missing! We are under a time problem because we are building this for our grandparents and have to leave town...and from the sound of it, several months before the part will arrive! Are these parts absolutely necessary? Can we move on without them? The script the guy at Harbor Freight was reading from said no...but what do you think?? I believe the main purpose of those "peak caps" is to help seal the 1" seam or gap that occurs where parts 8 and 9 come together, at the peak. The top "V" shaped part acts like a tiny flashing over that 1" seam. The center T bar of that rubber cap gets captured between the parts 8 and 9, so the little rubber cap stays in place. I don't know why you couldn't make your own little flashing by cutting a small piece of aluminum flashing, or something similar. Form a "V" shape to fit over the peak, covering the gap where 8 and 9 come together. You'd need to glue it in place with some clear silicone caulk or other good adhesive. You could also caulk under the bottom of the "V" as well. Do this before you put your panels in place. I'm sorry you're missing these pieces...but I'm glad it's not a part that would derail building the greenhouse for your grandparents. I hope it all goes smoothly from here on out! I have been putting one of these beasts together this weekend and I can't tell you how invaluable I have found your blog to be! I do have a question. None of my windows will fit nicely into the space between the rafters? Is there a trick to getting them to fit nicely? Any help would be much appreciated! Hello Chris, I'm glad you've found oms help here. I put all four of my windows on the same side of the roof, and I seem to recall that I did have to do quite a bit of unloosening bolts, wiggling frame parts, and retightening bolts to get the windows to fit together nicely. I'm hoping your fit will be improved if you do the same thing; you might be surprised at the flexibility in the frame, and how you can move things around by loosening, adjusting, and retightening. Have to commend you on a superb job documenting your build. 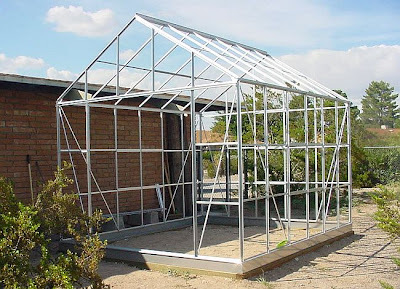 This has helped MANY folks...myself included...to smooth through the construction and mods to create a fine greenhouse. One question....what was the reason for your window orientation? Prevailing winds...or perhaps plans to use a single automatic opener? The thought processes behind your mods are extremely useful as I try to make this work out the best for my own needs. Glad you hear you're well on the way to enjoying your greenhouse! I can't claim much sound engineering theory behind placing all of our roof vents on the south side of our roof, except that the north side of the greenhouse is very close to the wall of our house, and I had the foggy notion that having the vents open to the south (facing the wide expanses of the open desert sky) might encourage better air circulation. My solution of abandoning the roof vents is not widely recommended, but I can get away with it because I replace most of my south wall panels with screens during hot weather, AND I installed a good exhaust fan to help move hot air out, AND I grow cacti that are quite tolerant of high interior temps. If you're considering buying automated roof vent operators, be sure to browse the GardenWeb greenhouse forum (or other internet gardening forums) for advice on brands. Many folks post that the ones sold by Harbor Freight wear out very quickly, and advise buying better quality vent operators from other greenhouse supply companies. I believe I have found a way to keep the doors closed without using the clamps you resorted to. I used them, too, for the few weeks since our greenhouse has been assembled. But last night, I could not sleep and recalled a similar problem we had had in the military. Of course, the Army answer cost thousands of dollars, but I solved it for about 85¢: I bought two 3/8 in bolts and two nuts to secure them to one side of the door frame. (In retrospect, I would use ¼" bolts and 1/8" holes.) Then I drilled two holes (one just above the second horizontal frame piece and one just above the second from the bottom) in each vertical frame member directly in line with the holes in the opposite door frame. I put 5/8" foam weather stripping up the right side frame, and poked the holes through that. After measuring to determine where the hole for the locking "mechanism" had to go, I ground down one side of the threads to make a flat area I could drill a 3/16" hole into. (Again, I over sized this: a 1/8" hole in a ¼" bolt would be more than sufficient, and a lot easier to do.) The spacing isn't critical (the weather stripping is forgiving), but it should be a fairly tight fit. Now there are two bolts (secured with nuts to the left door frame) that poke about an inch to the right and (when the doors are closed) through the matching holes in the right frame. I drop a short piece (~1¼" long) of an 8d duplex nail through the hole in each bolt and those doors will not come open unless someone removes the nails. Le, I apologize for somehow missing your good post and this solution for keeping the doors snugly closed. Sounds like a practical and simple solution to me, and the end result would be more aesthetically pleasing than the orange-handled clamps! The clamps have served me well, but my hands aren't strong enough to operate them with one hand only. As a result, I have to set my coffee cup down on the steps before entering the greenhouse in the morning; of course, this is a critical design flaw. Your solution might allow me to proceed with coffee in hand! Please help!!!! My doors are to long for opening. Does someone have some good instructions and pictures on the installation of the door framing?? I think I have done something wrong. I can't figure out how it would be possible to assemble the doors to arrive at an incorrect length since the holes for all the door frame pieces are predetermined. I haven't run into this problem before. If you'd like to email me directly at mudhouse@q.com I can try to help. Regarding leaks: I used weatherstripping around all my panels (as shown in Part Six of this blog, just scroll down to the very bottom of the page to find navigation to each Blog Part.) That may have helped me avoid any leaks (I'm not sure where your water is coming in.) I did still have leaks at the top of each corner post, and I filled those voids with silicone caulk. People do caulk panels in place, but I didn't do that myself, since I wanted the ability to remove them if necessary in the future. For example, I now find it's necessary to replace many of my original kit panels, because they have deteriorated from sun exposure after four years (see my comments on this at the very start of this blog.) If I had caulked the panels in place, it would make replacing them now a bit harder. Also, I remove some of my panels in the summer and replace them with screens I made, so I didn't want those caulked either. Regarding modifications for withstanding wind: This is critical, in my opinion, if you're going to build the Harbor Freight greenhouse. Please be sure to read Part Five of this blog, Modifying the Frame for Strength. These steps aren't difficult, and they can make a big difference. Also, please be sure to read Part Six, Adding the Panels, where I talk about the importance of screwing your panels into the frame. I don't advise just relying on the clips to hold the panels in place. They often are blown out in heavy winds, and this seems to be the major complaint against the Harbor Freight greenhouse. Regarding modifying for snow: I don't have this problem in my climate, but I can point you to a few threads in the GardenWeb greenhouse forum where people have discussed their own modifications. 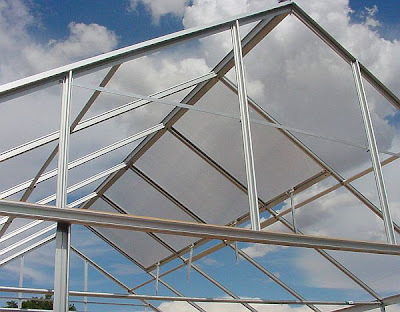 If you have heavy snows, your greenhouse may well need some reinforcements. You're welcome to email me directly at mudhouse@q.com for more help. Regarding doors: Charles (who posted the comment above yours about the door length problem) didn't contact me directly, so I didn't learn anymore about that issue. Perhaps some changes have been made to the kit? Let's try this, as a starting point. I just measured Part 33, Side Door Frame, on my greenouse doors. It measures 75 5/8" long, top to bottom. Does your Part 33 measure the same? (To be sure we are comparing the same thing, be sure to only measure Part 33 itself, top to bottom and not the other parts that Part 33 attaches to.) You are welcome to post back here, or to email me directly at mudhouse@q.com, and I will be happy to try to help. How have your vent windows held up to wind? Now that I have mine in, it seems that they're never really 'closed tight'. It seems like it would be very easy for wind to get under them, and with as weak as the vent frame is (and also part 42 that the locking arm hooks on), that they'll just get mangled when a good wind comes up. I have screwed the vent panels to the vent frame, so I'm not worried about the panels coming out of the frame. I'm worried about the whole vent frame getting bent. Greg, I had the same problem you're mentioning. I thought it might be the orientation of my greenhouse, and the direction of our winds, since other folks don't seem to complain about this very often. The roof vents, for me, were one of the weakest parts of the kit. Even when I had the roof vents shut down in the "tightest" position, the wind could pick the windows up a bit, and then slam them down again. Bang bang bang. Noisy and worrisome. Eventually this is what knocked one of the window poly panels loose from the window frame, causing me to uninstall all the windows and silicone the panels to the frame. So, you've already headed off that problem if you screwed the panels to the frame. I finally gave up on using my roof windows because of this problem. I was worried that some wind damage might occur at 2AM, or when I was gone. I wired my roof windows shut tight. When we replaced our roof panels in Oct 2011, I removed the roof vents entirely. I was able to live without the roof vents, because each summer I remove four wall panels and replace them with screened Aluminet panels. Also, my exhaust fan pulls air in through the open front doors (also screened with an Aluminet curtain) and out the exhaust fan. Without this extra ventilation, though, I am sure I would not have been able to give up the roof vents. Others have posted they couldn't live without the roof vents, and I understand that completely. I'm sorry I don't have a better solution for you, and I'm sorry you have the same problem I did. Maybe someone else will read this and post here with a better solution. Thanks for the reply. I'll get to work on an improved mount design, whether it be for an automatic opener or manual operation. As I see it so far, the vent frame needs to be more rigid, so it doesn't wobble from side to side (based on a center mount opener), and the support bracket on the inside also needs to be sturdier, so that it doesn't flex in a rotational manner. And, the vent needs to be actively held closed all the way, rather than having some play in the closed position. I think some additional aluminum angle pieces can solve the flex issues. I'll just need to figure out a design that will still allow an opener to be attached. I'll need some automatic venting, I'm sure, I just don't know how much yet. I am trying a solar powered attic vent fan mounted on the end opposite the doors. I don't have any idea yet, how much of the heat load it will be capable of handling on it's own. The third piece will potentially be a mister system, both to help humidity, as well as cool the temperature a little. The last piece will be that I'm going to try to pull some of the hot air out during the day into an underground heat sink. I don't expect that will contribute a lot, but since I'm planning on running the greenhouse on solar power only, I need as many natural features as possible for temperature control. I think you're right, there are likely ways to modify the roof vents so the frames are more solid, and remain fully closed, with some thoughtful re-engineering. 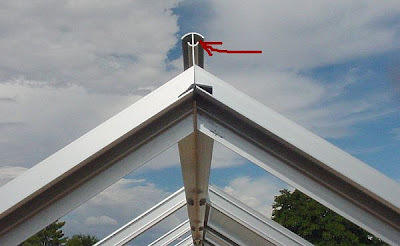 If you develop a fix for the "loose roof vent" problem, it would be great if you could post a thread with pics over on the GardenWeb greenhouse forum. I think your solution would be very helpful to other HFGH owners. 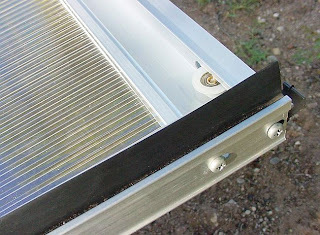 Another thing to consider about the roof vents is they will open under any shadecloth you use on the roof. 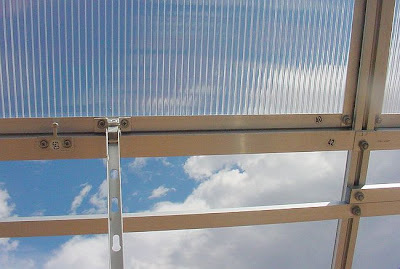 When I had operable roof vents, I found that my Aluminet shade cloth was stretchy enough to allow the vents to open, without tearing the fabric. I hope you will keep us posted on your build, and that you keep enjoying the process. I am trying without luck to fit the window panel correctly into the 38 and 39 frame. Could you post a detail how these go together. I can't get the groove the panel slides into to line up, I am probably not doing it correctly. Appreciate any help. Hi John. I can't share a photo of my assembled window vents, because I removed them three years ago, when I replaced all my roof panels. They just didn't operate right for me, so we decided to eliminate them. Parts 38 and 39 do not appear to have been changed, when I look at the illustrations of the parts in the parts list. But the illustrations have changed, and they're pretty different in the two manuals. My first suggestion is to go to the Harbor Freight website page, and download whichever manual you don't have, to see if the alternate illustration is more useful. I have a sneaky suspicion you may have the newer kit and newer manual. In the newer manual, the illustration on page 24 shows Parts 38 and 39 as forming very neat square corners, when you attach them to each other with the bolts. But in the older manual, the illustration on page 14 shows the two pieces resulting in a rather odd looking corner, with open edges. Not a neat square corner formed by overlapping pieces. This is more true to what I recall ours looked like. It's possible they updated the illustration and made it look "pretty" instead of truly showing you how the corner should look when assembled. You're correct, the groove to hold the panel should be aligned when you attach 38 to 39. Try using that as your guide, instead of worrying about making the corners look like the illustration in the new manual. Also, feel free to drop me an email at mudhouse@q.com if this isn't helpful to you. We'll figure it out. Hey there.... I know that the arrows on the cross braces on the doors are to be pointed up, however, what if there are no arrows on those parts? Just to let you know, all of your comments are coming through, but I've had to set my blog to require approval of each post before it will show up here (thanks to idiotic foreign pornographic spam that was showing up here, until I changed that setting!) So sometimes it takes me a bit to find and approve your comment to post. I'm very unhappy that HF has started leaving the arrow stickers off their parts. I'm also struggling a bit with your question, as I'm not understanding what you mean by the cross braces on the doors. The doors have been redesigned since my kit, but I do have the new manual. If you'd like to repost and refer to specific part numbers, or a specific page number in your manual, I'll be happy to try to help you sort this out. You're also welcome to email me directly at mudhouse@q.com, if that helps. Hey.... I apologize about the multiple comments, I wasn't sure if they were going through. I was referring to the central braces (part 36) that cross horizontally on the doors. It shows in the pictures in the manual that there are arrows pointing up as well as on your blog post on assembling the doors. I'm kind of at a loss because my parts don't have the arrows. In the manual that I have, it's on page 26, phase 11... door assembly and installation. Hi. We live just east of Portland , Oregon . My husband bought the greenhouse for me several months ago. He was going along great until he started to install the doors. Funky! They will not slide Any tips on putting them in? Thank you for this blog!! I'm running out the door right now, but I can tell you that if the doors won't slide, then something is wrong with how they have been installed on the tracks. They should slide very smoothly, when installed correctly. But I can also tell you that it's pretty easy to misunderstand the directions, and miss some critical elements of "how" to install the doors. They can be installed so the only "sort of" work, but that's not the right way. This problem surfaces every once in a while. If you have the newer model (69893) I'm less able to be helpful, as I've only been able to troubleshoot the doors on my model. But we can still brainstorm a bit. The front page of your manual will tell you which version of the kit you have. Please feel free to post back here with the model number, and I'll be happy to try to help! 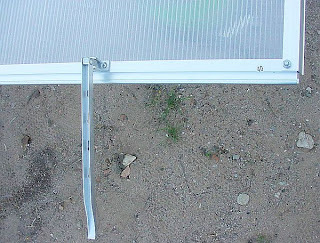 And, here is a thread with another little trick that helped my own doors slide a LOT more smoothly, right after we built the greenhouse. It might work for you too. If these don't help (wrong model number, or this is not the problem) please feel free to post back!